Irrigating cannabis forms a very important part of the entire process of growing it. Cannabis requires lots of water just as any other normal plant does and it is not surprising. New growers tend to overwater the plants initially, which can deeply reduce their growth and performance. 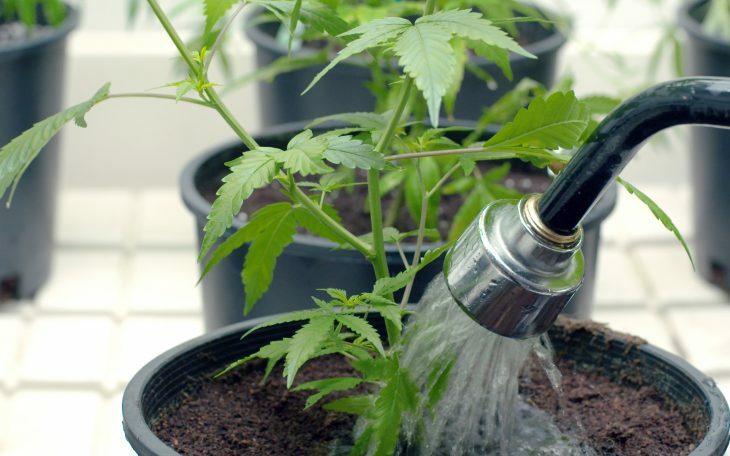 Irrigation of cannabis is a systematic process and you should put sufficient effort in order to irrigate them well. However, how often to irrigate them still remains unclear among the growers. It is important that you water the plants often and use the correct type of water as well. Seedlings need a lot of care because they dry out quickly. They may require to be watered two times a day depending on the environmental conditions. However, large plants should be allowed to dry out a little. This will allow the roots to expand and breathe more in search of water. These plants should ideally be watered once in 2-3 days in the morning. The frequency depends on two factors – the surrounding environment and the medium of growth in which you want to plant them i.e. soil, hydroponic or in coco coir. A very simple way to check for its dryness is to put your finger in the soil (up to 5cm) and if you find it dry, water else you can wait for another day for the same. This will help if you are growing it in the soil. In the case of coco coir, you should irrigate it once every 2 days and also manage the amount of water according to the situation. If you have a habit of adding nutrients regularly, you should decide the amount such that 10-20% extra water should drain out from the bottom of the pot. This will prevent the accumulation of nutrients in the system. You can even use a watering can, which provides the right volume at a time and the force with which it hits the plant is very smooth and perfect. In short, it pours out just the required amount and never overwaters the plants. Also, wash your plants with room-temperature, pH-balanced water before a few weeks of harvest to eliminate any waste nutrients, improve its taste, and reduce the harshness. Plants do live and just like any other living being, it needs water as a daily dose of energy and good health. This fact shouldn’t be taken for granted at any cost and it should be ensured that it is provided whatever is needed for its good and steady growth. You can follow our watering guide in case of any help.